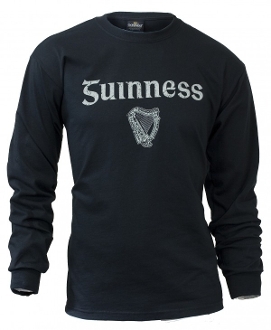 This Long Sleeved Guinness Tee is made from 100% brushed cotton. It features a classic crew neckline with long sleeves as well as ribbed cuffs and waist, making it ideal for day-to-day wear. The black tee feaures a vintage Guinness Harp logo on the front and distressed Guinness® Gaelic Label on the back, guaranteed to make you stand out from the crowd.